CHARLOTTE, N.C. -- For the first time in more than three years, Rory McIlroy has dropped out of the top 10 in the world rankings. Although it is more a matter of the mathematics and the two-year Official World Golf Ranking cycle, McIlroy's fall to 11th this week is yet another reminder of his struggles in 2013 after getting to No. 1 in the world. "It's not nice to drop out, over three years in the top 10, and you sort of get comfortable there," McIlroy said Wednesday at Quail Hollow, site of his first PGA Tour victory in 2010 and where he begins play in the Wells Fargo Championship on Thursday. "Hopefully I can get myself back up into that sort of territory I have been at the last few years." McIlroy, who turns 25 on Sunday, was No. 1 for a total of 39 weeks, the last before Tiger Woods captured the Arnold Palmer Invitational in March of last year. Woods, who is out following back surgery, is expected to relinquish the No. 1 spot in the coming weeks, but it won't be to McIlroy, mostly due to a poor 2013 in which he did not win on either the PGA Tour or European Tour. He also missed the cut at the Open Championship. As McIlroy correctly pointed out, most of his slide in the rankings is due to top finishes from his record in 2012 falling off or being diminished. 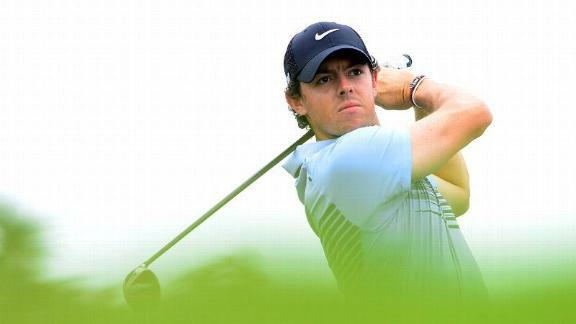 McIlroy won five times worldwide that year, including the PGA Championship. His only victory in 2013 came late in the year at the Australian Open. He's winless this year but has five top-10 finishes, including a tie for eighth at the Masters, his best finish ever at Augusta National. It was there, McIlroy said, that he figured out some putting issues that have been holding him back. McIlroy was third from the bottom of the field in putting for the week and said he missed 15 putts inside of 8 feet. "And that's not counting the ones I missed from inside 12 feet, 15 feet," McIlroy said. He realized he was standing too close to the ball, causing bad sight lines, and that his stance was too open, causing him to push the ball to the right. "Seems so simple and seems how can a tour pro make that mistake?" he said. "But you get into bad habits and it sort of takes a bad putting week or an eye opener like Augusta for me to say something needs to change here." McIlroy is about to begin a busy stretch that will allow him plenty of opportunities to make a move back into the top 10. After this week's Wells Fargo event, he will play the Players Championship next week, then following a week off will head to England for the European Tour's BMW PGA Championship. Then it's the Memorial Tournament, a week off, and the U.S. Open. It wasn't until last week that McIlroy decided to add the European Tour's flagship event to his schedule, saying "I wasn't going to play Wentworth, but I decided I'm playing well, might as well go knock it out." Rory McIlroy discusses his struggles over the past year and explains how Tiger Woods' advice helped him.